Rotorpac Industrial Waste Compactor offers 6:1 average compaction rate and does not require full-time operator. Dimensions are 7 ft 2.5 in. x 3 ft 11.25 in. x 5 ft 1 in., with loading height of 4 ft 10 in. and weight of 2,450 lb. Water resistant to pressure for power washing, machine will not operate if lockable front door is open. Also included are lockable emergency stop button and lockable mains isolator. KenBay's Rotorpac industrial waste compactor product is designed to replace the inefficient and costly "dumpster method" of industrial waste disposal and removal. Research shows that up to 80% of a dumpster's load can be air. That means that for every dollar spent on a dumpster service, 80 cents of it is, quite literally, thrown away. With an average 6:1 compaction rate, the Rotorpac is an increasingly popular method of automating and improving existing industrial waste disposal systems. 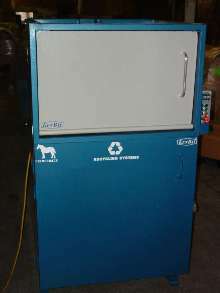 The Rotorpac is able to compact the entire contents of a traditional waste dumpster into one polyethylene bag. Easy to install and use, Rotorpac does not require a full-time operator, providing a considerable cost-savings to companies. Free 6 Minute Demo CD and customer testimonials are available - contact KenBay toll free at 888-353-6229 or via email at: mail@kenbay.com. The company is HQ'd in Mendham, NJ. Visit the company's website at www.kenbay.com. The Rotorpac's dimensions are 7' 2.5" x 3' 11.25" x 5' 1" - Loading Height is 4'10" - Weight is 2,450 lbs. Safety Features include: machine will not operate if lockable front door is open; lockable emergency stop button; lockable mains isolator; water resistant to pressure (for power washing); and Motor Overload protection.